Home / Crow Canyon Applications, Troubleshooting / How to troubleshoot Report Center issues? How to troubleshoot Report Center issues? I) Symptom: After configuring the report, when we click “Create Report” button, it shows list doesn’t exist error and and report is not created. This issue can happen if Report Center document library is not configured in Report Center page. To fix this please go to “Report Center” page from top link bar, New Report–> Edit the page–> Edit the New Report web part and select the Report Center document library as shown like below. II) Symptom: Error when creating the chart using flash chart rendering engine. Cause: Adobe flash player 6 is not installed. If the selected list has more than the lookup threshold or list view threshold, please fix it in central admin as shown below. Go to central administration–> application management –>manage web applications–> click on the web application you working on–>click on general settings in web applications ribbon–>click on Resource Throttling and increase the lookup count as shown below. IV) Symptom: A blank page appears in report center page and edit report page. (See screenshot). Cause: The selected list may have one or more duplicate columns. Generally SharePoint does not allow creating duplicate columns, however, sometime if we add a content type then it is possible to get duplicate columns with same name. For example, I have a list with Priority column and later I have added the Task Content type to this list and removed the content type again, in this case it is possible that the list ends up with two priority columns. This issue occur very rarely as it involves two content types with both having field with same name. Please check the list settings page and ensure that the list does not have any duplicate columns. V) Symptom: “Manage Templates” or “New Report” links in Report Center page is redirect to wrong URL. We need to configure the report links web part in all the pages that are present in the Report Center document library. Please go to Site Contents –> Report Center document library–> Copy the URLs of “Report and Manage Templates” pages and separate them with semicolon (;) and copy the new URL. Next go to Report Center document library –> Open “CCSReportsPageBaseTemplate” page –> Edit the page –> Edit Report Links web part –> Update the URL in “New Report Page URL” text box with the copied URL (see screenshot below). 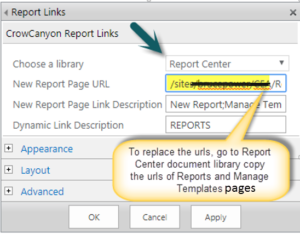 Repeat the above step for all the pages that are present in the Report Center document library. VI) Symptom: Access Denied error appears for the users when trying to access “Report Center” pages even though they have edit permissions on the site. Cause: This happens if the user is not having at least read permissions on the root site. Resolution: Grant read permissions on the root site for the users that need report center access.